Backpacking background: I have been hiking for four years, and backpacking for three. I get out on the trails or snow every weekend, regardless of the weather. My trips range anywhere from fairly short dayhikes to longer multi-day backpacking trips. In the winter I snowshoe or snow-climb in moderate terrain and occasionally participate in a glaciated climb. My typical winter pack is about 15 lb (6.8 kg) for a day trip, and 35 - 45 lb (16 - 20 kg) for a glacier climb with an overnight camp. In the summer my pack is around 25 lb (11 kg). Material: 6061-series aluminum blade and ferrule. Colors available: Not listed. Mine is blue with a silver handle. 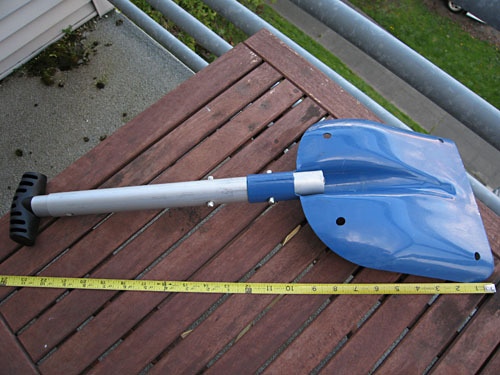 The Traverse EXT is a smaller, lightweight, three piece aluminum snow shovel. The shaft and handle are two separate nested oval tubes that telescope together, with U-shaped spring steel pieces inside that push buttons outwards through holes in the two shafts to lock them together. These shafts also can be partially nested into the shovel blade to reduce the overall length, or detached altogether and carried separately from the blade. The blade has four small holes near each corner for attaching to anchors or a rescue sled. This shovel has a T-handle made of a hard textured plastic. I try to carry a shovel on nearly every outing where I expect to encounter snow. It may not always see action, but when I do need it I am glad it's there. There are so many uses for a simple tool such as this that I greatly appreciate having it. I have taken this shovel on short snowshoe trips, long all-day outings, snow climbs, igloo-builds, and glacier climbing. It has also served well in digging out my car when the snow became too deep or plows deposited a berm in my path. I chose this shovel because of its weight primarily, but also because of its size. It is slightly smaller than other aluminum shovels but this also makes it more packable and less tempting to leave behind. The length of the handle, when fully extended, is also good and easier on my back than a shorter single piece model. This shovel will not store a probe inside the handle. I did not consider this important since I already owned a probe. 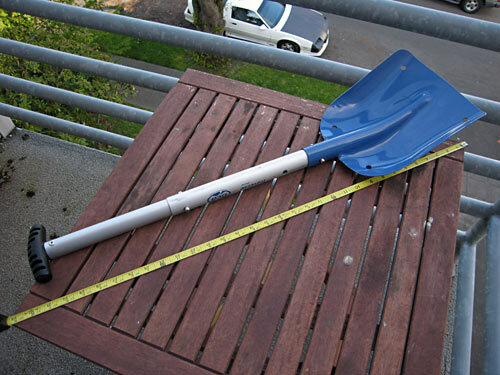 I typically carry this shovel on the outside of my Lowe-Alpine Snow Attack backpack for day-trips. For transport I detach the blade from the handle and store the blade in the large pocket on the back of the pack. The handle is telescoped to its shortest setting and stored on the side, cinched down with the compression straps. Several times I have left the handle on the blade and allowed it to poke up out of the pocket. It is short enough that it does not extend far above the pack and catch on low hanging branches. I carry it in a similar fashion when using my larger overnight backpack. One note on the size of the shovel. Backcountry Access lists the shortest length of the shovel at 23.75 in / 60 cm, however it can be further shortened without detaching the blade by moving the blade from the lowest spring button up to the second button. This will shorten the length to 21.5 in / 55 cm. With this setup the end of the shaft protrudes slightly from the back of the blade however. This shovel is quite robust and sturdy. When taking a glacier climbing course I was told several times not to buy a plastic shovel, but to stick with aluminum. I am glad I did. One of the first uses for this shovel was leveling a tent platform on the Easton glacier of Mt. Baker. The snow was soft at the surface but had a harder crust and even harder icy layer six inches down. Several others with plastic shovels chipped or cracked theirs. I was able to remove the soft snow easily with minimal effort. For the hard crust I had to push harder to penetrate it, but the shovel cut through quite well. I was able to pry out blocks of this hardened snow without bending the blade or the shaft. For the icy layer I was unable to push the blade in very far. I kicked onto the top of the blade to force it in and chip away where needed. The top of the blade is flat nearest the handle, providing just enough room for a boot. I have also used the shovel to excavate larger sitting and eating areas on various trips. Several of these structures have been 3 - 4 ft (0.9 - 1.2 m) deep and large enough to seat multiple people. The shovel, despite a smaller blade, moves snow very well. Washington Cascade snow is typically wet and heavy, not powdery. Because of this consistency I can scoop up a large blob of snow without much spilling out the sides. These scoops can be heavy, but the shovel had enough leverage and length that I didn't feel any back pain. The shape of the blade is also very nice. The bottom is very flat, leaving a nice smooth quality to the pits that it digs. 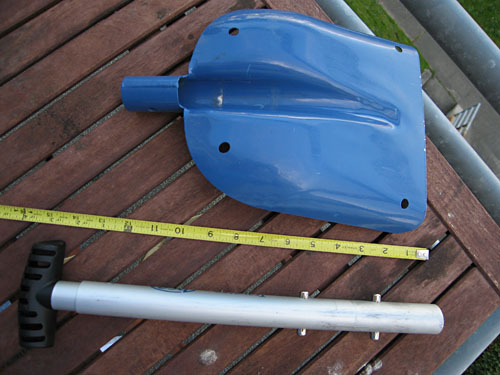 The telescoping handle is also very useful for shortening the shovel to work in a smaller area. This year I also had the chance to use it in powder snow conditions. This type of snow was difficult to shovel effectively and each scoop tended to spill over the sides of the blade. Because the blade of this shovel is smaller than others it took many more scoops to excavate a sitting space. I used the shovel more to fling snow away than scoop it, which seemed more effective. These were the only conditions under which I wanted a larger bladed scoop. One last use has been to dig out my car on several occasions. We became high-centered on the Tonga Ridge road in early winter and needed to dig out. The flatness of the blade and length of the handle worked very well to slide under the car behind the front wheels and scrape out the snow. It has also been useful in breaking down bumps of snow left beside the highway by passing snow plows. These can be hard and icy. The shovel was strong enough to cut into these and break them up, though they were a strain to lift. I like that the shovel collapses down small enough to store in my cargo area without sacrificing space. I typically leave it there all winter whether I'm going on a trip or not. The shovel has some scratches from two winters of constant use, but no serious damage. It still looks fairly new. The blue paint on the blade is holding up very well with only minor scratching on the leading edge, likely from rock strikes or digging out my car. On occasion I have had trouble with the telescoping handle. The majority of these have been due to the metal button pieces slipping out of place and into the handle shaft. When this happens the two handle segments can't lock together and these pieces are difficult to retrieve from inside. This has happened when I telescope the handle closed too quickly and catch the metal button, pushing it out of the holes. Only rarely has this happened, but securing the metal button pieces in place inside the shaft would prevent this.